Hi Fit and Awesome readers! I am so excited to be posting on behalf of Lindsay today. 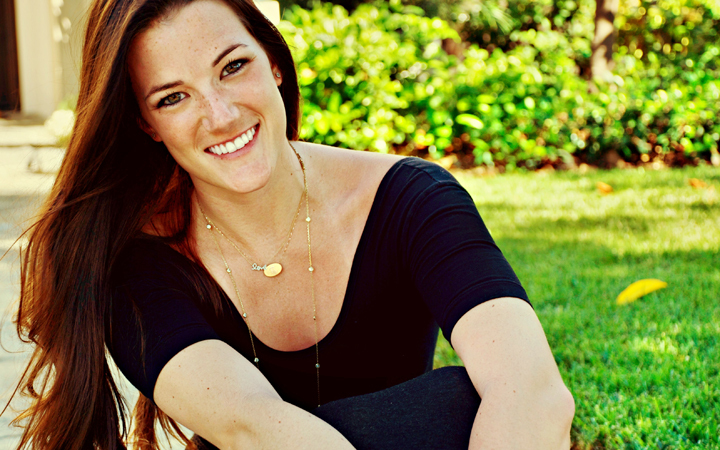 I’m Lisa, the blogger behind The Skinny on Health. TSOH is a health, wellness, and lifestyle blog that talks about health, nutrition, and fitness. 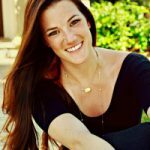 I’m currently getting my masters in nutrition and have a degree in human biology, so I explain how to actually lose weight and be healthy without all the craziness of fad dieting. Let me preface this by saying that juice cleanses are NOT recommended by dietitians and that they will NOT help you lose real weight or make you “skinny.” You might lose a couple pounds of water weight, but as soon as you eat again, that’ll change. 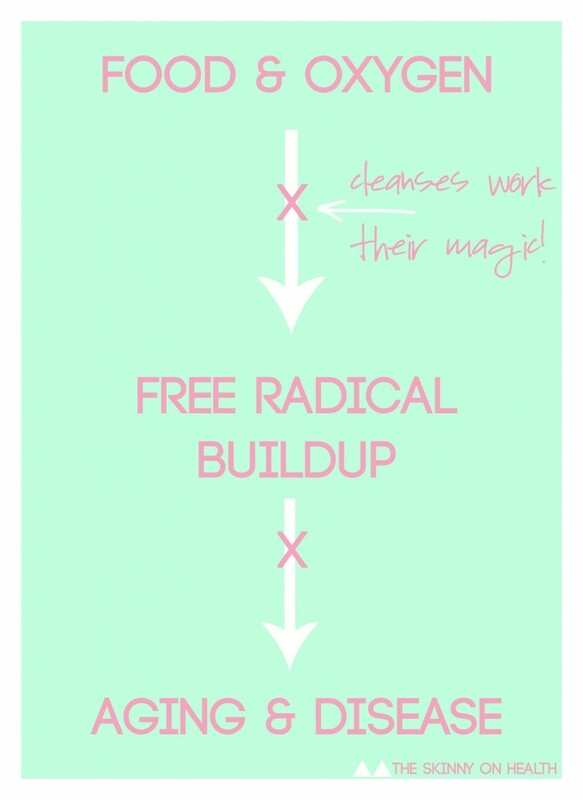 That being said, I am an advocate for cleanses (well, obviously, I make my own and sell it). Here’s why. No matter how healthy you are, your body takes in a lot of garbage. Everyone has their moments and eats junk now and then, healthy packaged foods are still packaged foods, and even if you are 100% clean eating natural foods, you’re still breathing. As long as you’re breathing, you’re building up yucky free radicals in the body. Oxygen causes the buildup of free radicals. This is a wholeee long process that takes place in the mitochondria (oh yea, remember high school bio?) that I cannot wait to have the time to write about in an easy-to-understand way. (Look out for that post later this month!) In the meantime, basically, oxygen → free radicals → aging, cancer and other diseases, slower metabolism…the list goes on. If the human body were a bicycle, oxygen is rust. Well, antioxidants are pretty much free radical killers. You all know berries and other foods have antioxidants, but I bet you didn’t know that your body naturally makes antioxidants without food, called superoxide dismutases. But, the process of eating and metabolizing food turns off these little guys, which further adds to the free radicals running wild. When you are on a cleanse, a juice one or a calorie restricted one, you give your body the chance to not only cleanse the liver and other metabolic organs, but more importantly, your body has the time to build up its natural antioxidants (primarily SOD2) to alleviate the buildup of free radicals. These natural antioxidants prevent aging, cancer, alzheimer’s, diabetes, and so many other diseases. I personally don’t like the idea of starvation and strict juice cleanses. That’s one thing I (and my clients) love about my cleanse: they are never hungry and you don’t have to give up eating food. 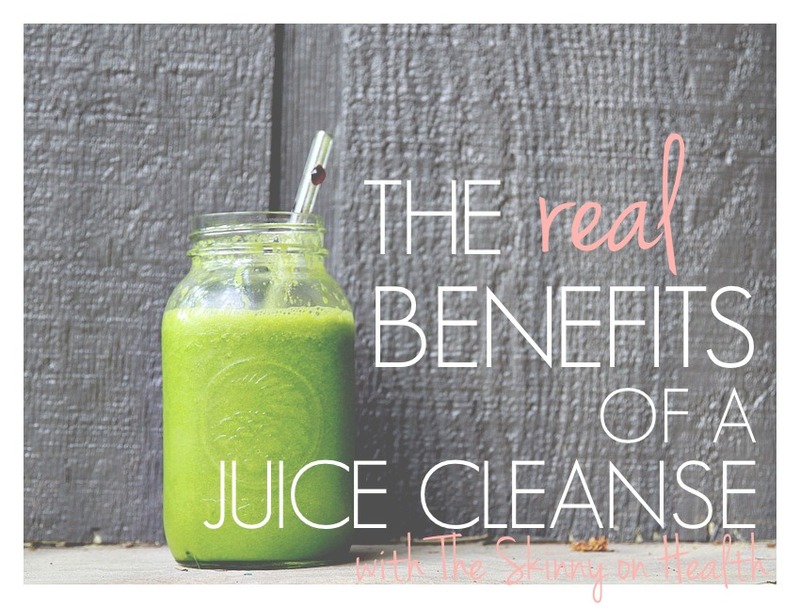 My cleanse also pairs perfectly with Suja juice. Suja has their own line of cleanse juices that are so. freaking. delicious. I drink them even when I’m not cleansing. You can get Suja juices and have them delivered right to your door here. If you don’t calorie restrict, I highly recommend a cleanse every month or few months. Not to lose weight, not to look thin, not to avoid dieting, but rather to build up the body’s natural defenses to fight disease and encourage healthy aging. You’ll thank me when you’re a healthy, active old lady! Actually, Lindsay is going to be trying out my cleanse pretty soon! Thanks so much for having me, Lindsay! You can find me over at The Skinny on Health, or on Bloglovin, Twitter, Facebook or Instagram! If you are looking to lose weight, I am also launching a completely free weight loss program, The Skinny Docs, April 1st, and you can subscribe to that here! If you aren’t cutting out food and I am assuming you’re still breathing your logic and your diagram make no sense. How is this better than promoting a diet high in fruits and vegetables which would provide you more fiber and is less expensive. This is a great point! Let me explain: Cutting out food and oxygen completely would totally shut down this pathway (figure one of this paper: http://clincancerres.aacrjournals.org/content/19/11/2810.figures-only), which we would not be able to survive doing. A juice cleanse, or smoothie cleanse like mine, is made up of fruits and vegetables, so you are still getting the necessary calories and minerals/vitamins from those. This would make it the same as just eating fruits and vegetables, however, the constriction of calories in a cleanse enhances the effects of antioxidants in fruits and vegetables. As you can see in the picture of the pathway mentioned above, when glucose and other food is consumed, a molecule called superoxide dismutase 2 is inactivated. This molecule is the body’s natural antioxidant (antioxidant = free radical killer), and is stronger than any antioxidants you can consume in the diet. By not consuming adequate food for a few days, you’re allowing this molecule to build up throughout the body. Even a decrease in calories by only 20% will cause some build up of the molecule. So, when on a cleanse, the body builds up it’s superoxide dismutase 2, which stunts free radical growth. This increase may not be as significant as not breathing oxygen or eating anything at all, but it is enough to combat the oxidative stress that we must withstand when breathing and eating. This is where aging comes into play (the last part of my diagram). With years of cleansing and building up the body’s SOD2 stores, over time, the damaging effects of oxygen are much slower than in someone who doesn’t cleanse. Oxidative damages take around 80 years to kill humans on average (not a coincidence that the average lifespan is around 80 years…), so decreasing oxidative damage on a regular basis through cleansing extends this process and allows you to add a few more healthy years to your life. I’ve spent around 3 years now researching this topic, and I know that’s not a lifetime, but it has become my specialty field of research. This is why I feel comfortable explaining it in such a public forum and am passionate about educating people about it. You’re so smart to challenge it, and I love seeing that passion about healthy living and science. If you’d like, here’s a list of really great research papers I read before writing this that have proved my very simplified diagram, so maybe if this description doesn’t help they might be able to shed more detailed light on the topic for you. Hunt, Nicole D., Dong-Hoon Hyun, Joanne S. Allard, Robin K. Minor, Mark P. Mattson, Donald K. Ingram, and Rafael de Cabo. “Bioenergetics Of Aging And Calorie Restriction.” Aging Research Reviews 5.2 (2006): 125-143. Print. Harman, D., 1956. Aging: a theory based on free radical and radiation chemistry. J. Gerontol. 11, 298–300. Chance, B., Sies, H., Boveris, A., 1979. Hydroperoxide metabolism in mammalian organs. Physiol. Rev. 59, 527– 605. Harman, D., 1972. The biologic clock: the mitochondria? J. Am. Geriatr. Soc. 20, 145–147. Sohal, R.S., Sohal, B.H., Orr, W.C., 1995. Mitochondrial superoxide and hydrogen peroxide generation, protein oxidative damage, and longevity in different species of flies. Free Radic. Biol. Med. 19, 499–504. Thannickal, V.J., Fanburg, B.L., 2000. Reactive oxygen species in cell signaling. Am. J. Physiol. Lung Cell. Mol. Physiol. 279, L1005–L1028. Hagen, T.M., Yowe, D.L., Bartholomew, J.C., Wehr, C.M., Do, K.L., Park, J.Y., Ames, B.N., 1997. Mitochondrial decay in hepatocytes from old rats: membrane potential declines, heterogeneity and oxidants increase. Proc. Natl. Acad. Sci. U.S.A. 94, 3064–3069. Drew, B., Phaneuf, S., Dirks, A., Selman, C., Gredilla, R., Lezza, A., Barja, G., Leeuwenburgh, C., 2003. Effects of aging and caloric restriction on mitochondrial energy production in gastrocnemius muscle and heart. Am. J. Physiol. Regul. Integr. Comp. Physiol. 284, R474–R480. Lee, C.M., Aspnes, L.E., Chung, S.S., Weindruch, R., Aiken, J.M., 1998. Influences of caloric restriction on age- associated skeletal muscle fiber characteristics and mitochondrial changes in rats and mice. Ann. N.Y. Acad. Sci. 854, 182–191. Muller-Hocker, J., Seibel, P., Schneiderbanger, K., Kadenbach, B., 1993. Different in situ hybridization patterns of mitochondrial DNA in cytochrome c oxidase-deficient extraocular muscle fibres in the elderly. Virchows Arch. A Pathol. Anat. Histopathol. 422, 7–15. Wei, Y.H., Ma, Y.S., Lee, H.C., Lee, C.F., Lu, C.Y., 2001. Mitochondrial theory of aging matures—roles of mtDNA mutation and oxidative stress in human aging. Zhonghua. Yi. Xue. Za. Zhi. (Taipei) 64, 259–270. Bevilacqua, L., Ramsey, J.J., Hagopian, K., Weindruch, R., Harper, M.E., 2005. Long-term caloric restriction increases UCP3 content but decreases proton leak and reactive oxygen species production in rat skeletal muscle mitochondria. Am. J. Physiol. Endocrinol. Metab. 289, E429–E438. Gredilla, R., Sanz, A., Lopez-Torres, M., Barja, G., 2001. Caloric restriction decreases mitochondrial free radical generation at complex I and lowers oxidative damage to mitochondrial DNA in the rat heart. FASEB J. 15, 1589–1591. Lambert, A.J., Merry, B.J., 2004. Effect of caloric restriction on mitochondrial reactive oxygen species production and bioenergetics: reversal by insulin. Am. J. Physiol. Regul. Integr. Comp. Physiol. 286, R71–R79. Lopez-Torres, M., Gredilla, R., Sanz, A., Barja, G., 2002. Influence of aging and long-term caloric restriction on oxygen radical generation and oxidative DNA damage in rat liver mitochondria. Free Radic. Biol. Med. 32, 882–889. Cohen, H.Y., Miller, C., Bitterman, K.J., Wall, N.R., Hekking, B., Kessler, B., Howitz, K.T., Gorospe, M., de Cabo, R., Sinclair, D.A., 2004. Calorie restriction promotes mammalian cell survival by inducing the SIRT1 deacetylase. Science 305, 390–392. Kaeberlein, M., McVey, M., Guarente, L., 1999. The SIR2/3/4 complex and SIR2 alone promote longevity in Saccharomyces cerevisiae by two different mechanisms. Genes Dev. 13, 2570–2580. Harper, M.E., Monemdjou, S., Ramsey, J.J., Weindruch, R., 1998. Age-related increase in mitochondrial proton leak and decrease in ATP turnover reactions in mouse hepatocytes. Am. J. Physiol. 275, E197–E206. McCay, C.M., Crowell, M.F., Maynard, L.A., 1989. The effect of retarded growth upon the length of life span and upon the ultimate body size. Nutrition 5, 155–171. Sohal, R.S., Weindruch, R., 1996. Oxidative stress, caloric restriction, and aging. Science 273, 59–63.